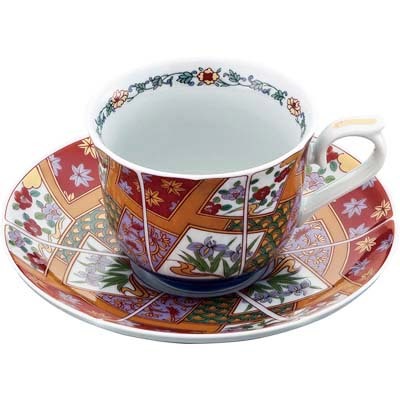 This is a Japanese ARITA-yaki (Arita ware) coffee cups set. Arita-yaki, also known as Imari is Japanese porcelain wares made in Arita, [W:Saga prefecture]. The history starts in early 17th century. Through the century, the fine porcelain ware became popular in European and Middle Eastern nobles. It is said that the value of Arita-yaki was the same as gold at that time. Arita-yaki is thin and light but it’s harder than pottery and very strong. Although many people see it as decorative art, it’s perfect to be used. The characteristics of Arita-yaki are the smooth texture and the white base color which is creamy and clear at the same time. Because a lot of works and time were put in each Arita-yaki, they are so beautiful and valuable.